Arrowhead Deck provides beautiful decorative concrete surfaces that are lasting and require minimal maintenance. Regular washing with a high-pressure nozzle prevent dirt and stains on the finish, while using a squeegee or push broom to remove standing water is the most effective method of minimizing mineral deposits. Water with high mineral content such as calcium, magnesium, and iron is defined as “hard water.” Over 85% of the US has hard water which creates “scale” and can take away from the beauty of decorative concrete finishes. The white deposits are left after the hard water evaporates, and is especially common in rural areas or areas on well water. Initially the minerals look like a sugar or salt and will continue to build up especially in lower areas where water pools on the deck surface. The minerals will continue to crystalize and can absorb sun tan lotion and body oils. Over time, the white crystals will start to turn dark from absorbing body oils and the deck will appear dirty. Cleaning and maintenance are necessary to remove the hard water mineral deposits. Water from sprinklers, hoses, and pool water can create standing water on exterior decorative concrete surfaces such as patios, driveways, walkways, and pool decks and worsen the condition. Water softeners replace the minerals with sodium, neutralizing and eliminating hard water. You can purchase an in-line garden hose water softener filter to avoid using hard water on your pool deck. However, if you have already developed scale on your patio, you must use particular caution when trying to clean the scale from the concrete coatings. Harsh chemicals can destroy the decorative concrete finish. Bleach and commercial lime scale cleaners work wonders on metallic and unpainted surfaces such as kitchens and baths, but sometimes destroy painted surfaces and remove the sealer. Light scale can be removed with vinegar. Mix equal parts of water and white vinegar in a spray bottle. White vinegar is a weak acid, strong enough to dissolve hard-water scale but not strong enough to ruin paint. We suggest using distilled water as it has very few minerals. Spray directly onto the scale and wait 15-20 minutes for the hard water to soften. Do not let the vinegar dry onto the scale. Wipe away with a soft, damp cloth. You may need to use full strength vinegar or repeat this process 2-3 times to completely remove the scale. If the scale is stubborn, try mixing a paste of 1 part vinegar and 3 parts baking soda. Apply the paste with a sponge and scrub gently, then allow the paste to penetrate for 15 minutes. Wipe the solution away with the sponge and repeat if necessary. 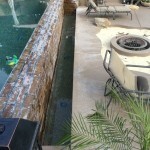 Heavier mineral deposits require more aggressive procedures such as a light muriatic acid wash. Always wear protective eye and skin wear when working with any acid solution. Follow safety guidelines printed on containers including use of proper respirator. Mix 20-40% Muriatic acid solution to water and dampen the concrete coated surface with a mist of water. NEVER add water to acid. NEVER apply acid to a dry surface. 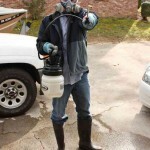 Apply the acid solution to the damp decorative concrete with plastic sprayer or sprinkler can. Lightly scrub deck with a deck broom until the solution stops “fizzing.” Do not allow solution to dry! Thoroughly rinse the acid wash off with a high pressure nozzle and squeegee or deck broom the concrete coating to remove excess water. Neutralize the area with soda ash, baking soda or TSP – scrub lightly. Rinse the area again and squeegee or broom off water. Heavier deposits may require additional treatments and possibly a stronger acid to water ratio. Neglected concrete coatings with lifting and heavy mineral deposits may require full deck removal and resurfacing. For additional information, tips, and design ideas visit www.ArrowheadDeck.com. Contact Arrowhead Deck and Concrete (623) 777-3933, Solutions@ArrowheadDeck.com for a free project analysis and consultation.